Business in a Box: An all-in-one solution to help build your business. We’ve brought together what you need in one place to launch an online store, accept payments anywhere, manage your finances and marketing, and fund your business. It all starts with a PayPal Business account. A curated solution to help start or grow your business. We’ve done the research to bring together powerful, yet easy-to-use tools that can help you build your business quickly. Everything works together. It all starts with a PayPal Business account, which ties together all the tools in Business in a Box. Save time and effort. In a single package, get ecommerce platforms, payment processing, accounting systems, and marketing tools. Rely on the experts. Leverage globally recognized and trusted brands to help bring credibility to your business and security to your checkout experience. From payments to small business funding, we have your business needs covered. PayPal payment processing is included in every box. Get paid online, in person or in store with PayPal Here, and via invoice. Plus, get Seller Protection on eligible transactions (limits apply). Whether you plan to do it yourself or to work with a developer, you can build and launch a beautiful online store that can help you drive sales. Track and organize sales and expenses, reconcile your accounts, and manage your finances from nearly anywhere. Plus, build customer and prospect lists and launch email marketing. Get access to funding for your business with a PayPal Business Loan or with PayPal Working Capital. ** Use the funds to help grow your business by purchasing inventory, investing in equipment, or managing cash flow. **Subject to eligibility and credit approval. The lender for PayPal Business Loan and PayPal Working Capital is WebBank, Member FDIC. To apply for PayPal Working Capital, your business must have a PayPal business or premier account for at least 90 days and process between $15,000 (or for premier accounts $20,000) and $20 million within 90 of those days or within any time period less than or equal to 12 months. PayPal sales include processing on PayPal Express Checkout, PayPal Payments Standard, PayPal Payments Pro, and PayPal Here. PayPal connects you with leading solution providers to help power your business. Getting started is simple. It’s free to sign up. Sign up for a PayPal Business account. It’s free to sign up and just takes a few minutes. If you already have an account, log in to get started. Tell us about your business, and we’ll recommend a box that helps meet your needs. Activate your box by following the setup instructions provided for each service. How much does Business in a Box cost? 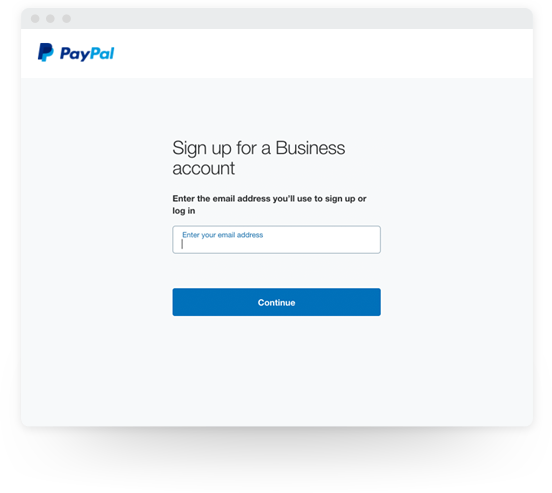 There’s no cost to sign up for a PayPal Business account. You only pay a low, transparent transaction fee when you get paid. See our fees page for more detail on pricing. 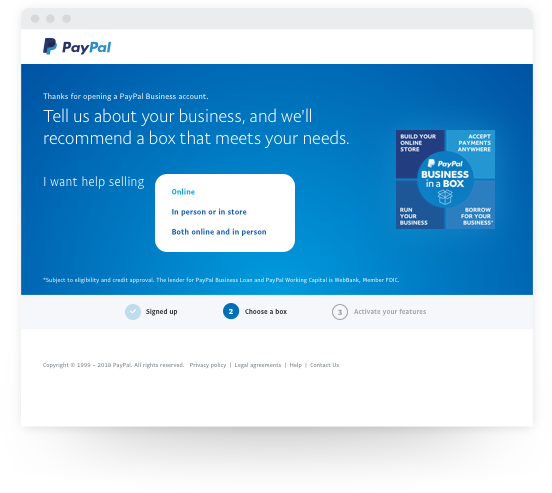 Each solution provider in the Business in a Box program offers a variety of pricing plans for their services, and many of them include an exclusive introductory offer for PayPal Business in a Box (see terms below). Other fees may apply, so visit each solution provider’s site for more about their fees. What introductory offers are available when I sign up? Why do I need to sign up for a PayPal Business account first? Do I have to sign up for all of the services and offers you recommend? What if I already have an account with one of these providers? What if I’m a non-profit? Start by creating your PayPal Business account. Not ready to sign up? Get best-practice advice to help you build a successful online business. Offers are sponsored by the respective partner; PayPal is not a sponsor of, does not endorse, and is not responsible for any partner offer. All partner offers must be redeemed by March 31, 2019 at 11:59 PM Pacific Time. 1 Business in a Box merchants can receive a 1-month free of charge trial of GoDaddy GoCentral Website Builder with the option to subscribe at $24.99/month for a monthly term plan or $239.88/year (equivalent to $19.99/month) for an annual term plan (“Offer”). To receive this Offer you must a) have a US PayPal business account in good standing, b) sign up for a new GoDaddy GoCentral account, and c) sign up from the box you viewed from PayPal. A credit card is not required to sign-up for the free trial, however you can choose to subscribe to a GoCentral plan at any time during the free trial. Once you provide a credit card to your GoDaddy account, you will be charged for the applicable GoCentral plan once the free trial ends, which will automatically renew until cancelled. If you do not add a credit card to your GoDaddy account your GoCentral account will be suspended 40 days after the start of your free trial. After day 80 from the start of your trial your site content will no longer be available. You can cancel your GoDaddy account at any time with no penalties. GoDaddy and PayPal each reserve the right to cancel, suspend or modify part of this entire Offer at any time without notice, for any reason in their sole discretion. This Offer cannot be resold, transferred or combined with any other Offer. This Offer applies to the GoCentral Online Store subscription plans only and not for additional services or products purchased through GoDaddy. 2 Business in a Box merchants can receive a 60-day trial of Shopify Plan services (“Offer”). To receive this Offer, you must; a) be 18 years of age or at least the age of majority in the jurisdiction where you reside or from which you use this Service, b) have a U.S. PayPal business account in good standing, c) be a new Shopify account holder signing up for a new Shopify account, d) sign up from the box you viewed from PayPal. You will receive a 60-day free trial on any Shopify Plan, excluding Shopify Plus. This Offer is for standard Shopify Plan subscription fees only and not for additional services or products purchased through Shopify. A valid credit card is required on all live Shopify stores: your credit card will not be charged during the Offer period unless you purchase additional products or services from Shopify. 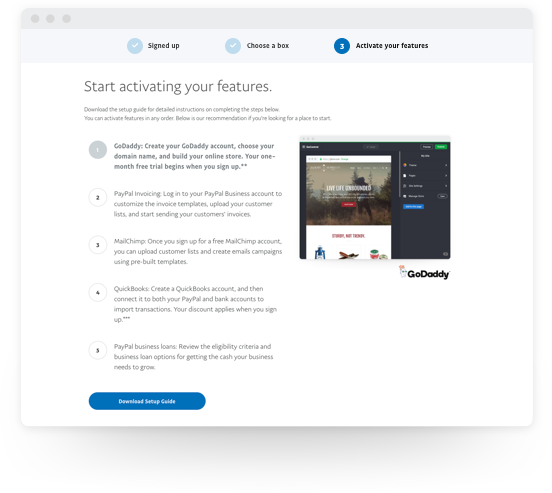 After the 60-day Offer period, Shopify will automatically set up recurring billing for the monthly Shopify Plan you selected. This fee will be billed monthly in advance to the credit card you have on file with Shopify. If you do not add a credit card to your Shopify account, then after your 60-day trial, your Shopify account will be suspended. You can cancel your Shopify account at any time, with no penalties. Shopify and PayPal each reserve the right to cancel, suspend or modify part of this entire Offer at any time without notice, for any reason in their sole discretion. This Offer cannot be resold, transferred or combined with any other Offer. 3 Business in Box merchants can receive 40% off the monthly list price for new QuickBooks Online (Simple Start, Plus, Essentials) subscription(s) or 60% off new QuickBooks Self-Employed subscription(s) for the first 6 months of service, starting at sign up, at which time your account on file we be automatically charged each month at the applicable discounted rate. After the discount period (starting month 7), your account on file will be automatically charged at the then-current list fee for the service(s) you’ve selected, unless you cancel before the billing date. Offer valid for new QuickBooks Online customers only. To cancel your subscription, call 866-272-8734 x111. Offer is valid for a limited time only. To receive this Offer, you must; a) have a U.S. PayPal business account in good standing, b) be a new QuickBooks account holder signing up for a new QuickBooks account, c) sign up from the box you viewed from PayPal. Intuit and PayPal each reserve the right to cancel, suspend or modify part of this entire Offer at any time without notice, for any reason in their sole discretion. This Offer cannot be resold, transferred or combined with any other Offer. 4 Business in a Box merchants who sign up for a trial subscription to Xero can receive a 50% off the monthly subscription cost for the first four months and a complimentary one-hour consultation with an advisor (“Offer”). To receive this Offer, you must: a) be 18 years of age or at least the age of majority in the jurisdiction where you reside or from which you use this Service, b) have a U.S. PayPal business account in good standing, c) be a new Xero subscriber signing up for a trial subscription, d) sign up from the box you viewed from PayPal. When you convert your trial subscription to a paid subscription, you will receive a 50% discount on the monthly subscription cost for the first four months and Xero will make available to you to an advisor for the free one-hour consultation. After the Offer period, standard subscription fees will apply. Subscription fees will be charged automatically monthly in advance to the credit card you have on file with Xero. By accepting the offer to receive a free one-hour consultation with an advisor, you acknowledge and agree that (a) such free one-hour consultation may be provided by a third-party advisor that is not affiliated with Xero, depending on your needs; (b) Xero is not responsible for services provided by third-party advisors; and © Xero does not guarantee the services of any third-party advisor in any way. You acknowledge that third-party advisors may charge fees for additional services in excess of the free one-hour consultation with your express agreement, and your third-party advisor may contact you about additional offers for paid services. You agree that Xero is not responsible for payment of any fees for services you incur with your third-party advisor. You further agree that Xero may provide your name and contact information to a third-party advisor for excess of the free one-hour consultation with your express agreement, and your third-party advisor may contact you about additional offers for paid services. You agree that Xero is not responsible for payment of any fees for services you incur with your third-party advisor. You further agree that Xero may provide your name and contact information to a third-party advisor for the purposes of setting up the free one-hour consultation. Xero is not a professional services firm and is not in the business of giving professional advice (including financial services, legal, accounting, tax or any other professional services). You are solely responsible for seeking out professional and independent legal, financial, accounting, tax or other professional services advice when you need it.